couple thoughts on how to dig a hole for a tree. One is to dig a hole a few inches deeper than the root-ball, install the tree and mound the dirt a few inches up the trunk to provide some stability. Yikes! Did you know a trees roots need oxygen? Soil added around a tree reduces the amount of oxygen available to the roots and slows the rate of gas exchange in and around the roots. There may be less moisture and nutrients available to the roots or too much moisture may remain around the tree’s roots. Inadequate oxygen reaching the roots or microorganisms in the soil around the roots can lead to an accumulation of chemicals that can injure tree roots. The tree’s bark may decay where the soil is newly in contact with it. Damage or injury to the tree because of the added soil may not become apparent for several months or years and generally appears as a slow decline followed by death. Another is to dig as much as twice as deep as the height of the root ball and back fill the hole enough to accommodate the size of the root ball then install the root-ball in the hole. 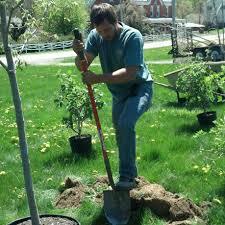 The idea behind the deep hole is to allow the tree an opportunity to establish a deep root system. Here is the problem associated with this school of thought. 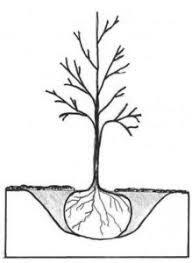 When a hole is dug too deeply, and the tree is placed in the hole the loose soil under the root-ball compacts, the tree often begins to sink creating the same result over time as stated above. Truth time. Years of experience in the tree planting business has taught us to measure the depth of the root-ball before you begin digging. A simple way to do this is to use the handle of your shovel. With the shovel handle pointed down and the tree standing, mark the handle with a length of string or tape this way you can check the depth as you dig periodically. If you don’t quite make it the whole depth, that is okay too. Mounding soil up to the sides of the root-ball a few inches is perfectly acceptable providing you give the tree some support for the first growing season.